Preeti Mistry is the chef/co-owner of Juhu Beach Club and Navi Kitchen. 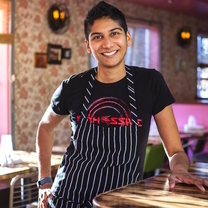 She is a filmmaker-turned-chef who cooks Indian fare with a distinctly Bay Area sensibility — it's aggressively tasty food made from the best ingredients, and it's served in a casual, fun environment. She was a season six contestant on the popular show Top Chef. If you ever wondered what a restaurant Armageddon looks like, this is pretty close. For Juhu Beach Club’s chef Preeti Mistry, an ordinary Saturday morphed into the kind of day that feels like a tennis-ball machine of doom. What fun! Pretty pictures to help ease the pain from animator Sonnye Lim. "BBQ. Oakland. Chef Britni Mills killin it @staygoldoakland"
"Two hour lunch with @lettuceeatkale, thanks to Amod Chopra at Viks! #imsofull"